Our season at Alaska Premier Charters, Inc. runs from early May until Mid-September. 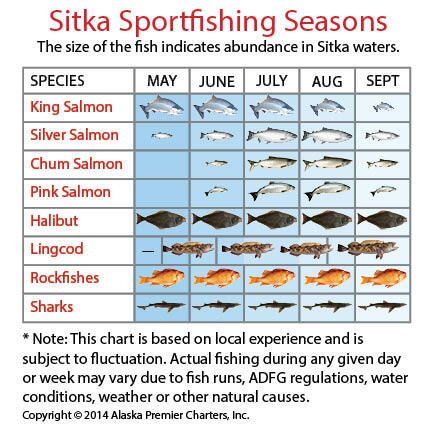 The following explains which species of fish are commonly available in Sitka and when is the best time to come fishing. It also explains how to identify the fish species. See ADFG (Alaska Department of Fish and Game) for detailed current Southeast sportfishing regulations. Chinook (King) Salmon (Oncorhynchus tshawytscha) come on strong in the middle of May and usually stay strong until the beginning of August. Immature black-mouth King Salmon show up in late Summer and winter (in Sitka waters), feeding and growing in preparation for spawning at the end of the following Summer. Identification: Blue-gray back, silvery sides and white underbellies and a dark gray, almost black mouth and black gums. Black irregular spotting on the back, dorsal and tail fins. Maroon to olive brown in color when spawning. Firm, richly flavored flesh ranging from deep red to ivory white. Learn more about King Salmon, click here. See photos of Salmon our guests have caught, click here. Coho (Silver) Salmon (Oncorhynchus Kisutch) start coming around in late June, and really become plentiful in mid-July, finally tapering off in September. The daily bag limit is six silver salmon per day for both resident and non-resident anglers. Identification: Greenish-blue back with bright silvery sides and lighter, gray-white gums. Small black spots on back and dorsal fins and top lobe of tail. No black spots on lower lobe of tail. Full flavored, firm textured, naturally red flesh. Chum (Dog) Salmon (Oncorhynchus keta) are available mainly in July and August. The daily bag limit is six chum salmon per day for both resident and non-resident anglers. Identification: Dull gray back with yellowish-silver sides, no distinct spots on back or tail. Large dilated pupils. Very forked tail. Olive green backs and maroon sides with irregular dull red bars when spawning. Milder, more delicate flavored, creamy pink to medium red flesh. Pink (Humpy) Salmon (Oncorhynchus gorbuscha) are available mainly in July and August. The daily bag limit is six pink salmon per day for both resident and non-resident anglers. Identification: Steely blue backs with many large dark spots and silvery sides. Black oval spots on both tail lobes. Very small scales. Dull gray-brown (male) or dark green patchy (female) backs and creamy white bellies when spawning. Males develop a hump. Halibut (Hippoglossus Stenolepsis) start showing up in April, become prolific in May, and generally are caught through the first half of September. Weather becomes quite stormy late September and on into the fall, which makes halibut fishing more difficult. The current regulations limit guided anglers on charter boats to one halibut per day, with a reverse slot limit. The 2018 guided anglers may retain one Halibut up to 38 inches and shorter (which is 26 lbs. & smaller), OR those 80 inches or longer (276 lbs. or bigger). Any Halibut between 38 inches and 80 inches may not be retained. Identification: Dark brown (top) side and a white (bottom) side. Both eyes on the dark side of its body when mature (8-12 years old). Delicate, firm, flaky, sweet flavored, snow-white flesh. Learn more about Halibut, click here. See Halibut photos our guests have caught, click here. Lingcod (ophiodon elongatus) season is open from May 16th thru November 30th. While in season, there is a slot limit for non-residents between 30-35 inches for one fish and the second has to be 55 inches or greater; both cannot be caught on the same day or be the same size. Identification: Back and sides vary in color, from grey, brown, green and orange, with darker spotting and mottling on upper parts. Long body, large head and mouth and a mix of large canine teeth and smaller teeth. Rigid spines on foward part of dorsal fin. Rockfish can be caught May-September. There are many species of rockfish, which all have different limits. Pelagic rockfish are found in mid-water. These include Black, Yellowtail and Dusky Rockfish. There is a daily bag limit of five per day. Non-Pelagic rockfish are found on or near rocky ocean bottom. These include Yelloweye, Canary, Copper, Silvergray, Tiger, China and Quillback. There is a bag limit of one non-pelagic rockfish per day EXCEPT the Yelloweye Rockfish is a one-annual limit. There is a closure on all Non-Pelagic rockfish from August 1st through August 21st. Reopens August 22nd for the rest of the year. See ADFG for more on limits and identification. Sharks are always around and can be caught April-September, but the shark season is really great from mid-July through all of August when the water temperature rises. 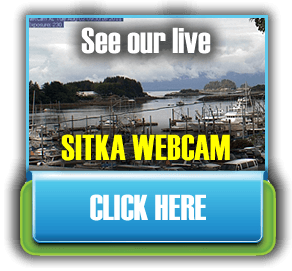 Species you might find in Sitka include Blue, Salmon and Dog Sharks. Other species you might catch are Ratfish, Skate, and Wolf Eels.